Additional Info: Ms. Veronica Mascaro has enjoyed 27 years of private flute and piccolo instruction. In that time, Ms. Mascaro has had the pleasure and honor of working with flutists of many different ages and expertise. Veronica offers a caring yet professional learning atmosphere for her students. Veronica has been a soloist with many local symphonies and is a member of the Kennett Symphony Orchestra, the Cantatica Chamber group, the Bel Canto Lyric Opera Orchestra and the Mascaro~Newman Flute and Guitar Duo. 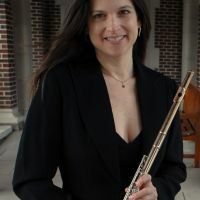 During the summer of 2009, she served as principal flute with the Opera in the Ozarks Opera Orchestra in Eureka Springs, Arkansas.